Acquired: Originally traded to Edmonton from Hamilton on Oct. 2, 2017, in exchange for two players Edmonton’s negotiation list. Contract extended on Dec. 12, 2017. 2018: In 16 games (16 starts), Gable has rushed 196 times for 1,063 yards and seven touchdowns as well as 34 receptions for 212 yards and one touchdown. This is Gable’s first career 1,000-yard rushing season. In Week Three, Gable rushed for career-high 165 yards and a touchdown on 23 carries and was named a CFL Player of the Week 3 and 21. 2017: In four games played (four starts), Gable became the fourth running back to eclipse the 100-yard mark and ran for 100+ yards in back-to-back games with the Eskimos. Gable finished with 833 rushing yards and seven touchdowns on 146 carries and 285 receiving yards and one touchdown on 34 receptions. In the West Semi-Final, Gable rushed for 107 yards and two touchdowns on 16 carries and caught four passes for 37 yards. In the West Final, Gable rushed for 54 yards and one touchdown on 12 carries and caught two passes for five yards. (Hamilton) In nine games played, Gable has rushed for 466 yards and five touchdowns on 74 carries as well as 25 receptions for 186 yards. 2016: (Hamilton) Gable appeared in 15 games for the Tiger-Cats and recorded 693 rushing yards and three touchdowns on 126 carries and 405 receiving yards and one touchdown on 39 receptions. In the East Semi-Final, Gable recorded nine carries and one touchdown on 21 carries and four reception for 53 yards. Gable also was named a CFL East All-Star. 2015: (Hamilton) Appearing in five games, Gable recorded 47 carries for 293 yards and 10 receptions for 82 yards. Gable played in both playoff games, recording 22 carries for 117 yards and seven receptions for 64 yards. 2014: (Hamilton) Gable recorded 128 yards and touchdowns on 30 carries and 18 receptions for 224 yards and two touchdowns in seven regular season games for the Tiger-Cats. 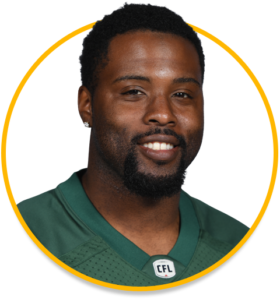 2013: (Hamilton) In his first season in the CFL, Gable appeared in 15 games where he accumulated 782 rushing yards and seven touchdowns on 130 carries and 600 receiving yards and five touchdowns on 55 receptions. Gable also returned 12 kickoffs for 228 yards. He started all three games in the playoffs where he recorded 71 rushing yards and one touchdown as well as 10 receptions for 77 yards and a touchdown. Gable was a runner-up for the CFL’s Most Outstanding Rookie Award and also earned a CFL East All-Star award. Pro: Gable spent time in New Orleans and Denver in 2011 and the Nebraska Danger of the Indoor Football League in 2012. Gable attended the University of Southern California from 2006 – 2010 where he appeared in 41 games recording 308 carries for 1,549 rushing yards and 13 touchdowns while making 19 receptions in his career as a Trojan. Gable ranks sixth on USC’s all-time kickoff return list with 1,010 yards, won three Rose Bowl championships in 2006-08, and was the first true freshman in USC history to start a season opener at tailback.